Do you love the gorgeous color and video on your laptop's LCD, but find the long battery life of e-ink displays tempting? 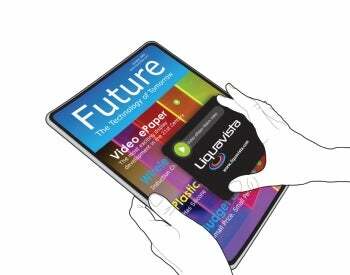 Dutch display company Liquavista might have the solution for you. By using a process called "electrowetting," Liquavista has created high efficiency displays that not only show text and still photos in color, but can also animate videos. What differentiates electrowetting from a traditional e-ink display, like the one on your Kindle or Nook? E-ink uses an electric field to move pigment particles in order to make text and images, while Liquavista's electrowetting process uses electric charge to move colored oil drops to change a display's color or to play a video. Because of the high switching speed of electrowetting, this microfluidic phenomenon is perfect for applications that require little power draw, like e-book readers or smartphones. Some of the advantages of electrowetting over LCDs include that electrowetting draws less voltage and power than a traditional LCD. Displays using electrowetting can also be thinner than their LCD counterparts, as well as up to eight times brighter because of the lack of polarizers required for the electrowetting technology displays.